This item consists of 1pcs SONOFF Slampher + 1 pcs RF 433MHz Remote Controller. 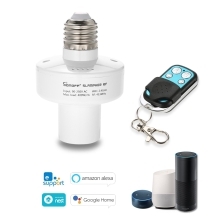 Sonoff Slampher can connect to light bulbs with E27 screw base. Slampher smart bulb holder can be remotely controlled via App eWeLink by smartphone or controlled by remote controller indoors. Slampher WIFI light switch makes all light bulbs smart. As long as the mobile phone has network, users can remotely turn on/off the lights from anywhere at any time. It also supports timing turning on/off the appliances at a specified time, and share to others so that you can control your smart home together with your family. You can also voice control your home appliances by Amazon Alexa, and for Google Home/Nest, and enjoy intelligent life and make your home smarter. *Consist of 1*SONOFF Slampher RF + 1*RF 433MHz Remote Controller for home automation. *Remote ON/OFF: Turn electrical devices on/off from anywhere anytime. *Timing: Supports 8 enabled scheduled/countdown/loop timing tasks to turn on/off at specified time. *Smart Scene: Trigger on/off by temperature or other environmental conditions. *Supports numerous WiFi smart switches one smart phone. *Remote Controller with button slide cover to protect buttons avoid accidental unplanned operation. *Remote Control&apos;s handy key chain size attaches to your car keys no more unwanted bulkiness.